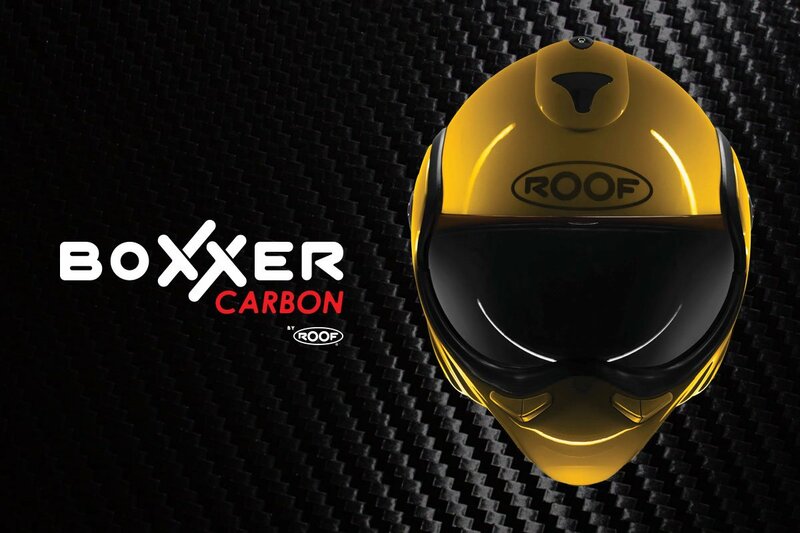 The brand new Roof Boxxer helmet, (note Boxxer with two XXs), has been around for years; in fact, it was over 20 years ago that the fledgling manufacturer introduced its very first Boxer helmet. It was totally innovative, and a huge and instant success, not only for its dramatic fighter-pilot looks, but also because it was the first motorcycle helmet that could legally be worn in both open and closed configurations. 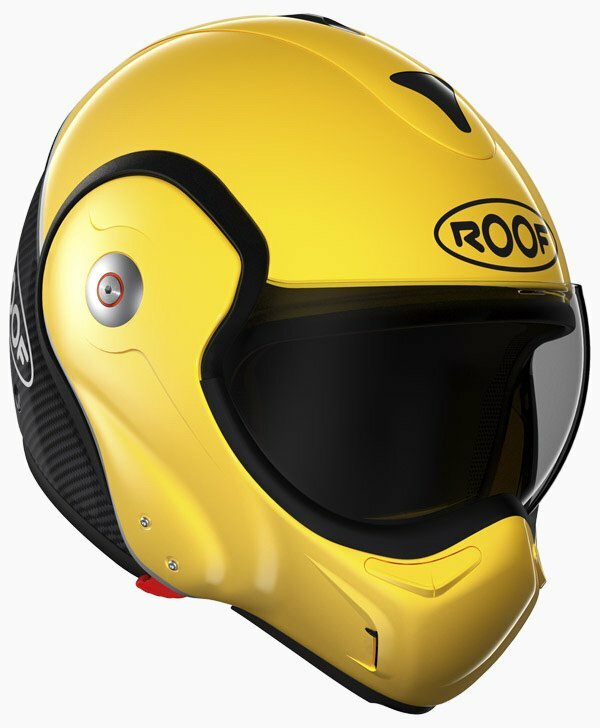 At one stage, the Roof Boxer was the best-selling motorcycle helmet in the world. And, to date, over a million examples have been sold. But it was was time for an update, because the current Boxer was not perfect. And so Roof decided to go all out and create the ultimate incarnation of its classic design. Thus was born the brand new Boxxer Carbon. The basic premiss of the helmet is, of course, unchanged. The chin bar can be rotated 180°, taking it totally round to the back of the shell. This leaves the rider with what is a very useable and credible, open-face helmet. An open-face that, nonetheless, has a very useable drop-down visor. 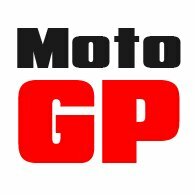 Of course, the helmet is both P and J rated, which means it can be worn legally on the bike in both the open and closed positions. Most flip-lid helmets, by the way, cannot be worn open on the road. 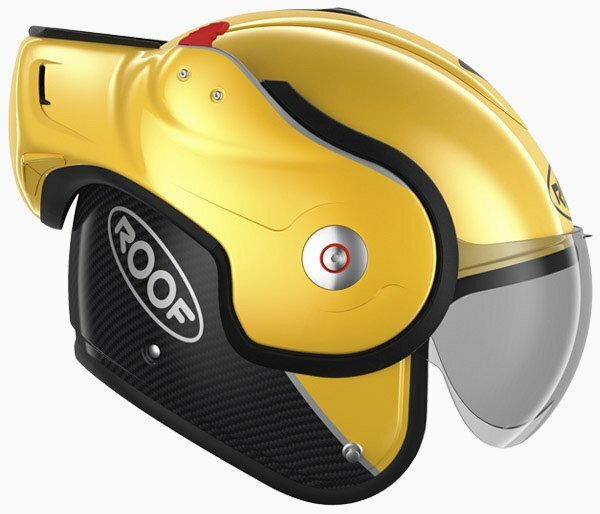 The only helmet on the market that works like the Roof is Shark’s Evo-One 2. Now that’s a great helmet, but it’s a different proposition altogether. It’s more about touring and commuting. It’s incredibly heavy by comparison, and not as much fun to wear. On the subject of weight, the Boxxer Carbon obviously has a completely carbon shell. As a result, it’s incredibly light, and comes in at a full 100 grammes lighter than its predecessor. The venting, always done cleverly on a Boxer, is now even better; it allows air to flow through the helmet and out of the exhaust vents more cleverly than before. But, in our view, one of the most interesting developments has been in the area of the chin-bar locking mechanism. On the old model, it was a bit of a hit-and-miss affair; it didn’t always operate very smoothly. The new mechanism is way better. It’s more precise, more solid, more reliable, and smoother. It just works. With the new helmet, you also lose the prominent ‘bunny ears’ that were present when the old helmet was worn in the open position. Some people thought they were fun, but most people didn’t like them. For us, we see nothing but improvement with the Boxxer Carbon; and we love it. The carbon weave is gorgeous, and the helmet is super-light. We like the subtle, grown-up graphical treatments, and we think it looks much better than the old model. More importantly, it simply works much better. Now, just one word of caution. With its revised interior, the new Boxxer Carbon is also quieter than its predecessor, but this is not a helmet you would necessarily buy to commute of tour in. Quiet is not really its thing. The Roof always has been, in our view, an urban-style helmet, or at least a helmet for shorter weekend rides. It’s a helmet for those who love the idea of an open-face, but who accept that, occasionally, a full-face makes more sense. It’s always been a brilliant concept, and this is the ultimate version; the best ever Boxxer. If you’ve always fancied a Roof but weren’t quite sure, now’s the time to buy one. Now, it really is impressive. The price is also pretty reasonable; the helmet is much, much cheaper than it is on the continent, and it comes in a pretty impressive array of sizes; seven in total. Order online, or come and see us. They’re in stock now. This movie is a fiction filmed on closed roads by professional riders. In all circumstances, respect the rules of the road for your safety and that of others. This behavior must not be reproduced.